Just before 7 am yesterday, I hopped on my bike headed to my usual Thursday morning boot camp exercise. Suffering from a minor cold, I wasn’t feeling great and had contemplated canceling. I am glad I didn't. As I turned the corner at the end of the alley, I caught sight of the sky looming large over an adjacent construction site. Clouds upon clouds stretched from here to the aquamarine mountains in the far distance. This usual eyesore of a construction site seemed oddly beautiful. The blue grandeur and imposing white clouds gleamed over the piles of excavated dirt, towering cranes, and the grimy, spitting, urinating hard-hatted workers. As I stood on that street corner mesmerized by the vastness of it all, a gentle coolness breezed by. And I...I inhaled...and inhaled again through my sniffling nose. Ahhh, it’s going to be a beautiful day. Seeing those clouds upon clouds stretching from here to there miraculously imparts energy and healing to even the most depressed of souls. Beijing suddenly seems beautiful. Beijing the beautiful. Beijing the clean. Beijing blue. 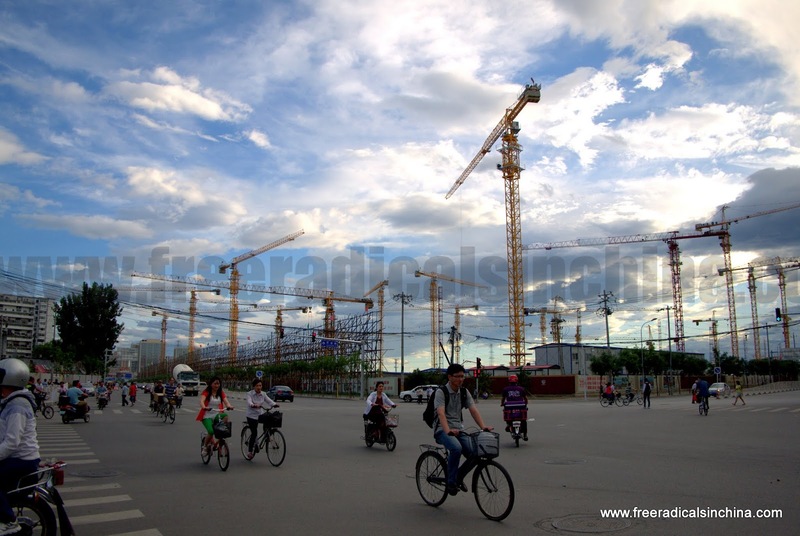 Beijing made anew. Those clouds make those cranes look good! Yesterday--and today-- will go down in history as the nicest days EVER I personally have EVER experienced EVER in Beijing. In fact, the previous month had so many remarkably nice days, that the remarkable days stopped being so remarkable. 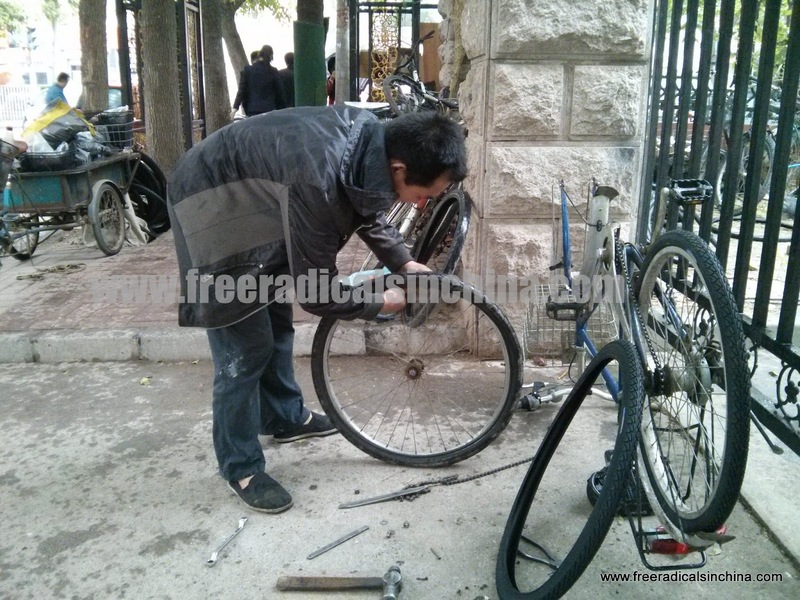 Is Beijing’s notorious air problem being resolved? Is this the start of a new era of easy breathing for Beijing and her inhabitants? 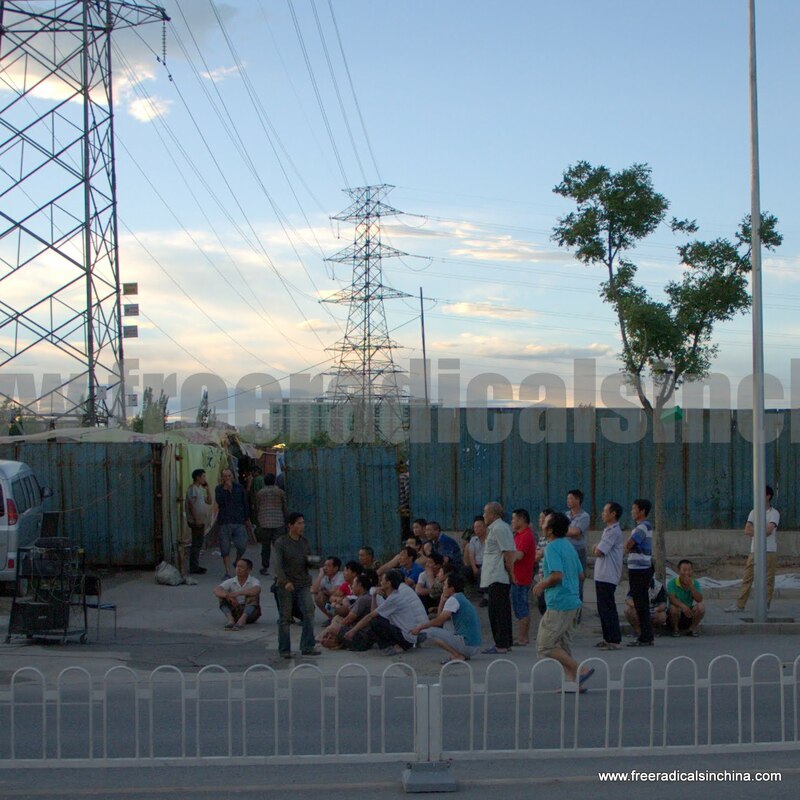 Will Beijing gray turn into Beijing blue? We may not be standing at the door of a pollution-free China just yet, but recent reports do support anecdotal musings that air quality is in fact improving. The average density of PM2.5 dropped 20 percent during the first four months this year, compared to the same period last year . The year 2014 saw an average decrease in PM2.5 concentrations compared to the previous year . These reports are based on U.S. Embassy gathered data, so we don’t have to be concerned that China’s government is making it all up. 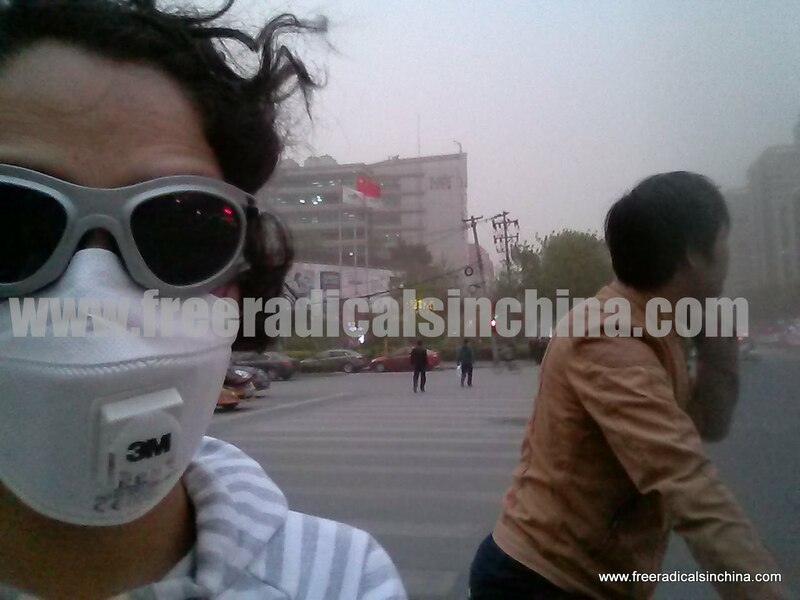 Truly, Beijing’s air quality is improving. The government may be finally responding to both domestic and international discontent. Air pollution is a popular conversation topic here (especially when a Chinese person is trying to understand why a foreigner would move to such a polluted city). A recent online documentary blaming a newborn baby’s benign tumor on air pollution and criticizing China’s air pollution policies went viral . Rare forms of cancer in children have been attributed to prolonged exposure to PM2.5  . In general, China has a poor reputation internationally for not caring about the environment. A scientific study linking China’s air pollution with erratic weather in the United States is another reason to put China on environmental blacklists . In addition, Beijing is in the running for hosting the 2022 Winter Olympics. Surely, China wouldn’t want persistent pollution to sway voters to say nay . The government claims that this year’s improved air quality results from implementing air pollution policies in and around Beijing. Drivers have been denied car registration. Coal plants have been shut down or moved elsewhere. And most recently, smoking has been banned. (Smoking is probably not a major contributor to poor air quality, but any decrease in pollution is more than welcome!) 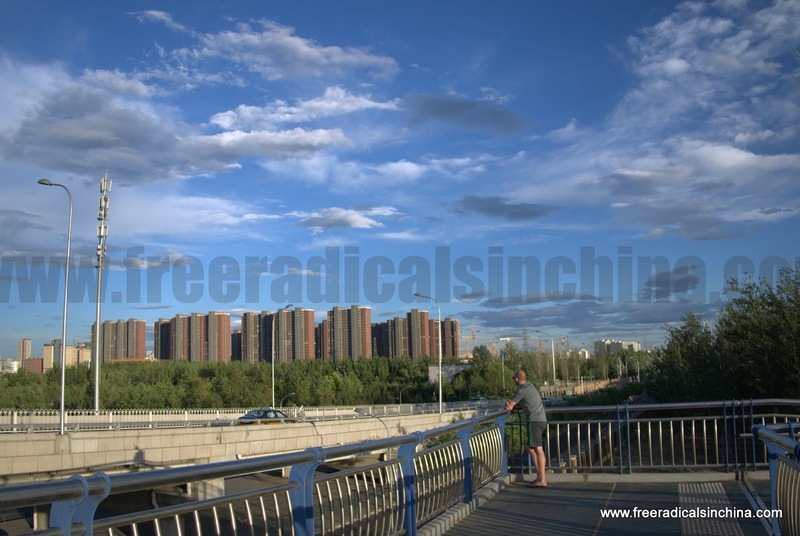 Recent strong winds and intermittent rain also keep Beijing gray at bay. So for now, we are breathing a little easier under Beijing’s luminous skies. We leave the air masks at home. The stars greet us at night. Clouds upon clouds stretch from here to there. And I...I inhale...and inhale again. Sniffling nose. What sniffling nose? 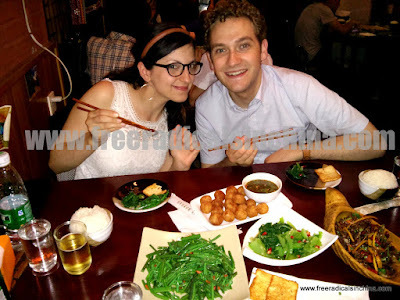 Chinese Sentence of the blog: 多美好的一天嗯？Duō měihǎo de yītiān ń? English Translation:　What a beautiful day, huh? 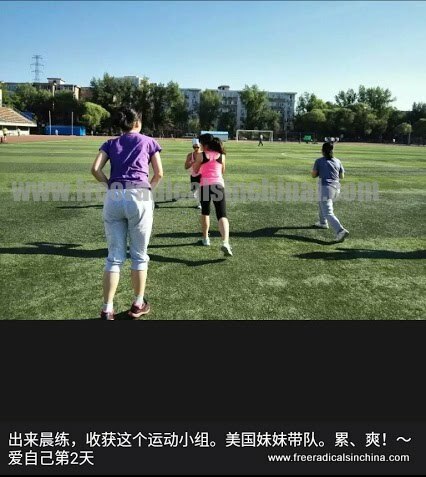 My bootcamp got posted on a bystander's Wechat. The captions says something like this, "Came out for morning exercise, there was an exercise group. American girl led the group. So tired! Love self on the second day." Facebook is very happy because he can see blue sky today. Hoping and wishing for the mail to come. I blame learning Chinese on my lack of enthusiasm for blogging. Living as a foreigner in China certainly provides plenty of material for interesting blogs. There’s air pollution, finding beets in a western market, working as an indoor cycling instructor, sand and rain storms, bicycle repair, buying electricity, Chinese viewpoints on love and marriage, learning Chinese, recent trips etc etc etc. Unfortunately, all I have swirling around in my head is Chinese. I give up. Here are some pictures from the last few months. 3/23 Chicken lady asked if I wanted the tough or the tender chicken. I said give me the tender one and cut out the guts, and cut off the head and feet. 3/ 23 That poor chicken made a delightful chicken noodle soup. 4/3 A nice day to hang in a pagoda. 4/16 Nothing but blue after the sandstorm! Great day for morning boot camp! 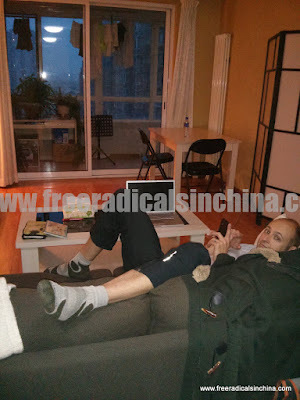 4/21 birdMAN went to Sichuan for a week with his highschoolers. Here is a Chengdu panda. 4/28 Love is in the air! 4/23 Occasionally I pretend I am a professional photographer. Here's a nice shot of soon-to-be Mr. and Mrs. Happy Smiley Couple. They were so much fun to photograph! 4/30 Last summer, I started leading a boot camp session with my friends twice a week. 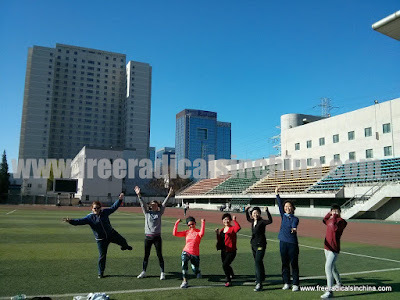 You can imagine what a spectacle we are running around doing burpees, push-ups, and jumping jacks. This is Selena. She asked to join and has become a regular participant. Usually I have four to five random people join each time. Then they bring their friends. It's nice having my own fan club. 5/2 New pizza place run by a Californian opened up nearby. We are sooooo happy. 5/8 Threw a ladies only party in honor of my almost married friend. 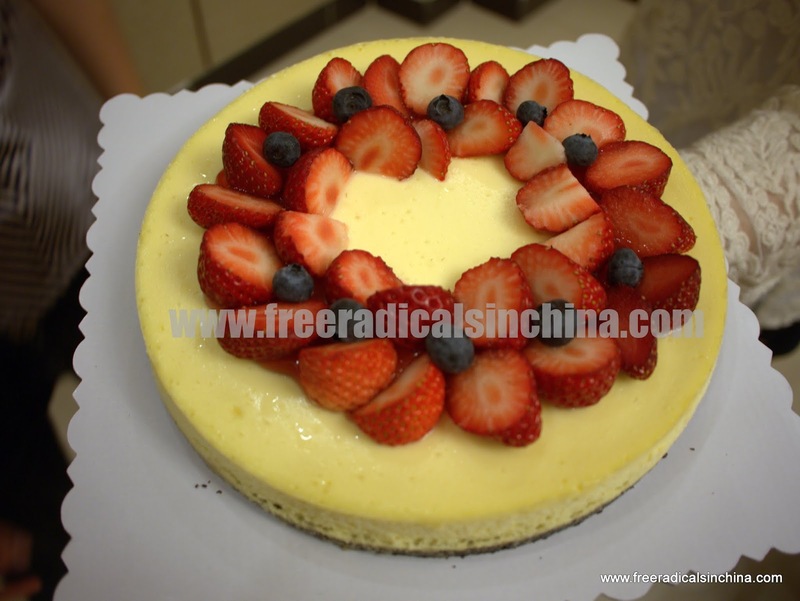 Most cheesecake in Chinese bakeries are spongy with a slight cheese flavor. This cheesecake is not like that. It was dense just like cheesecakes are meant to be. Totally worth 180 RMB. 5/14 We had a straight week of AMAZING weather. Perfect temperatures and blue skies. 5/18 Sandwiches in Sanlitun. Sometimes we like to pretend we are rich and hang out where the rich people are. 5/18 The weather was so sublime that day. Come back nice weather! 5/21 What's that in my salad? BEETS! Yes I found real beets at a foreign market. I admit, not as sweet as California beets, but good enough to satisfy my beet cravings. 5/29 It's officially summer. It's hot. It's muggy.. And it's time to eat BBQ.